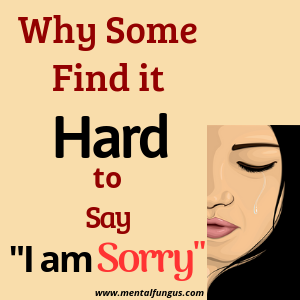 Only I was at fault – Some people don’t say sorry as they have a misconception that if they apologize they will be considered as the one who was at fault. They avoid saying sorry because they believe that the one who apologizes first is usually the one who has a major contribution in arising the conflict. So it is better not to ask for sorry otherwise I will be blamed for everything. Other’s fault is bigger than mine – One more reason some try to avoid saying sorry is they believe that others fault was bigger than mine so the other should be saying sorry. They also accept their mistake but for them, their own mistake hasn’t damaged their relationship as much as the fault of other counterparts. So if they are not feeling sorry they assume they have a genuine reason for it. According to them, every conflict has two extents of faults, major fault, and minor fault. And theirs is always minor. So they always need an apology. I always say sorry first – above mention reason applicable to those who don’t apologize for egoistic reasons. But sometimes a person doesn’t say sorry and behind it, there is always a genuine reason for not doing so. If you are the one who always apologizes first in your relationship even if you are not guilty then it is quite acceptable if you at this time resisting yourself to say sorry and wishing in your heart that the other would come and say sorry. Because it hurts when only you have to make compromises and make the first move to save the relationship. Soon he/she will be saying sorry – This is the most common reason why people don’t say sorry. It is another reason why an egoistic person does not to apologize. This often happens especially in those relationships where one knows that the other person is soft-hearted, So they assume that sooner he/she (Soft-Hearted one) will be saying sorry. So they don’t feel the need to apologize. The one who is benevolent often pays the price for being a soft-hearted person. And the priced is he/she always has to make the first move to resolve the matter. It’s sad but true. Strengthen bond – The best part of saying sorry is not that it put things back on track but it strengthens your bond too. Apologizing doesn’t mean fault was your but it shows that you prioritize your relationship over your ego. When you apologize your partner sees how much importance you give to them. These three magical words “I am sorry” shows that you value their presence in your life. It Lessens Your Ego – The only thing that stops you from saying sorry is your ego. Your ego will keep on telling you that if you say sorry you will become the person who always discords a well-going relation. Ego never likes to bow down to anyone even if it is your mistake. Moreover, ego will give you all sort of reasons and logic to not to feel sorry. But when you admit that you too had a significant share in making the matter worse than you don’t give enough room for the ego to grow. Thus apologizing lessens your ego at least, if not dissolves completely. You Priorities Your Relationship – When you say sorry you make sure nothing comes in between your relationship. You realize that fights and silly misunderstandings are the part and parcel of a relationship. What makes a relationship healthy is admitting your mistake. You also understand that anything in life can be attained but if a relationship turns sour and doesn’t fix on time you might end up being alone with sweet memories afterward. So it’s better to learn from your mistake as soon as possible rather than to repent later. One word is enough to save your relation that is “Sorry” and another can ruin it that is “Ego”. You decide what’s important to you. You Perceived as Kind Hearted – When you apologize it shows your kind-Heartedness. People see how tender your heart is. For you, your relation matters the most. How quickly you resolved the conflict is something that only a well-mannered person do. You save yourself from those “No Talk” days – Fight happens in every relationship but if it goes to an extent where communication completely pauses that is when it starts spoiling your Day and Nights. The Greatest reward of apologizing is you save yourself from those “no talk” days. You know it very well that whenever a conflict arises in a relationship the first that thing happens is both of you Switch on to “No Conversation” mode. And that is something which kills both of you every moment. It’s better to say sorry and start talking instead of waiting for him/her to come and say sorry. These “No Talk” days are insanely frustrating because everything seems in your hand, whether to talk or keep the distance. You can end this frustrating Phase in a second by genuinely apologizing. So learn to accept your mistake and see how beautiful life is just by saying the three magical words known as I am Sorry. Which of the following Statement Suits you Most.